It is spectacular!! We are EXTREMELY happy with it. It was such a pleasure working with you and the outcome is better than we ever envisioned .. the colors of the ribbing, the fit, the shapely elegance of the mica – it’s all just perfect. I’m attaching a few photos. They don’t quite do it justice but you can get a pretty good idea of how well it blends with both the original collar and the existing ceiling fixture. Thank you so much for your patience, support and vision. We couldn’t be happier with our latest Sue Johnson super original!! We brought home our new lamp last Saturday afternoon, placed it on the mantle, and were inspired to rearrange objects around it to give it it’s proper living space. We were done 7 hours later, as the rearranging and reorganizing spread to the rest of the living room, kitchen, and hallway. 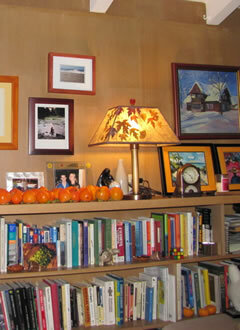 I love the lamp, I gaze at it often, and the mantle is now my new favorite space in the house. Thanks! The lampshade is absolutely fantastic! Hand-painted shade by Orgelina Wiese, design from an antique embroidered shawl. I just picked up my custom lamp shade last weekend and thought you might want to see the finished product. 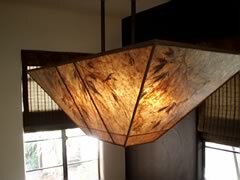 This was a replacement for the (broken) glass shade on a George Kovacs dining room fixture that we installed several years ago in our house in Berkeley. 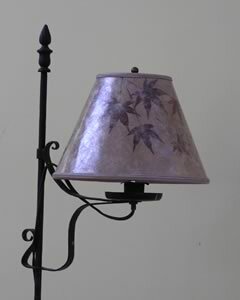 It matches the fixture beautifully and is an elegant improvement to original shade. 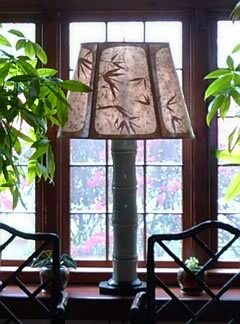 Sue: I bought a lampshade from Orgelina (unsure of spelling) last weekend, and it has been installed on a small base (pictures attached). It is a great match, and we are very appreciative of the guidance and help we received from Orgelina! Thanks so much and we are anticipating a return to your store when we return to the area from Murphys, California (Gold Country on Highway 4). 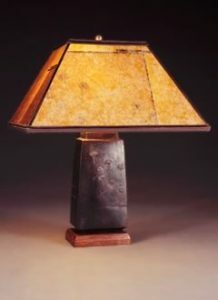 After searching for just the right lamp for my mother’s secretary, I found your website and chose your Mini Raku Fetish Pot lamp with the Green Mica Shade, I knew immediately that your work was outstanding and certainly was not disappointed. This beautiful piece of art looks perfect on the secretary and completes my living room and I just wanted to thank you and your very nice staff for all their help. Here is your beautiful work in situ. Thanks again! 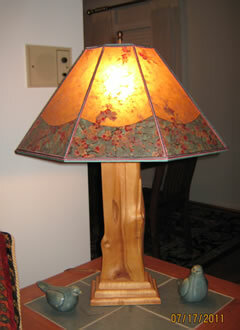 I thought I’d send a photo of the lampshade you made for us, atop the base made by my wife Kimberly’s grandfather. We think it looks just beautiful. Thanks again, and we may be stopping by the next time we’re in California. Thanks so much. You can see how well our new lamp fits in with our décor! 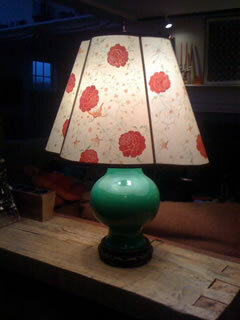 The lamps arrived Friday and they are absolutely fabulous! We are so pleased and for the first time a product that I bought on the web exceeded my expectations. Could you make two matching wall sconces that are 10″ wide?…. Please let me know about the sconces and thanks again for the lamps which just make the room they are in! 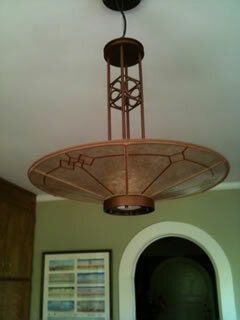 The lampshade and finial arrived today in great shape. It looks wonderful! Thank you so much for your perseverance – I love the color of the mica and also the delicate pine needles (nice to know they’re from across the street). I appreciate all your hard work and will treasure this art piece. 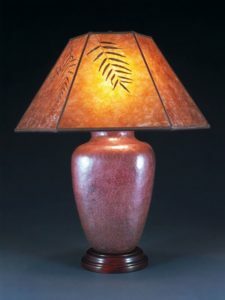 We have bought lamps from you for about 20 years, and still adore every one. I just wanted to let you know that the lamp shade and sconces arrived safely and look beautiful. It has been a pleasure working with you. 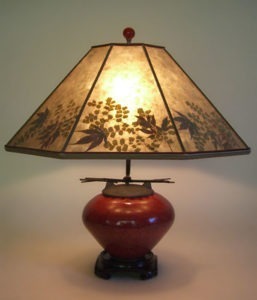 The lampshade is beautiful and the proportions are just perfect, it really works on the narrow table we have in front of a window and is absolutely stunning from the side when you walk into the room or from the front as in the picture. Sorry it isn’t a better picture, but we are still in the process of re-decorating the whole house and will be finished early next year… The red bamboo lamp also is perfect and has been getting rave reviews from our neighbors and daughter. Please thank the people that made these beautiful lamps for us. I received the lampshade. It turned out wonderful!!! Thank you for all your help. It truly turned my lamp into the art piece it was intended. Here are a few photos of this work of art you and your crew created…. they’re a bit embarrassing for me to send out as a professional but, they’re handheld on a consumer camera so, bear with me… I am absolutely in love with this fixture! It has transformed that room….. I’ve decided that you should have called it “Spring Wind” as it appears the Japanese Maple is blowing in a heavy wind with leaves flying free of the branches……. just stunning. Some feed back from friends who were over when I brought it home and hung it was glowing. Thanx to you, Hank and your whole crew for such wonderful work! Thanks. 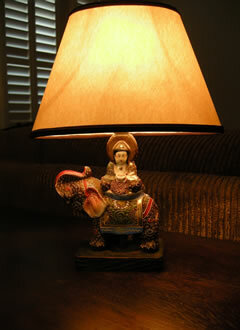 The lamp arrived on my birthday – great present! It’s as beautiful as I’d hoped. My wife and I had you make us a lampshade, awhile back. 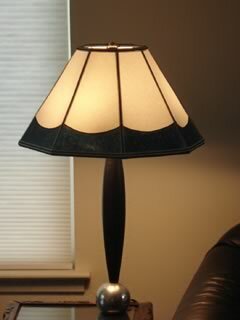 I have been meaning to send you a picture of the lamp with the shade on. We are really very happy with the lampshade, it has really given my wife’s lamp a new life. My lampshade has arrived in perfect condition: it was marvelously packaged with its double box. I am very happy with the result. 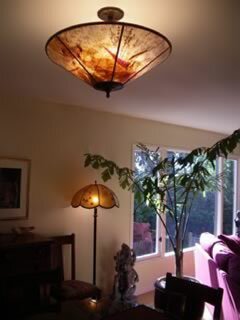 As I had told you, I have with me 5 of your lampshades that were made at your store when I was living in Berkeley 15 years ago (I was one of your first enthusiastic customers) and I am glad to see that the quality of the work that you provide has not changed. It is a pleasure to see such stability: it reminds me of the craft to which I was accustomed when I was living in France. 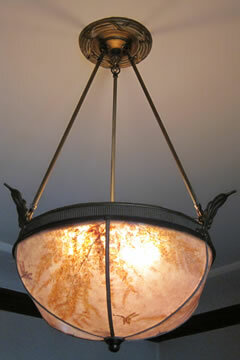 As we discussed, we are attaching a photo of the new lamp shade your company made for our brass Florentine lamp. It looks great, don’t you think so? Please tell Mary that we appreciate her work. Hi Sue. Received the new shade and it is just right!!!! Very lovely and perfect for all. Thank you for your open way of dealing with the first shade difficulties. I very much appreciate working with someone who is willing to take a responsible and helpful solution oriented, and may I add, timely response and producing the second extremely lovely shade. Thank you. 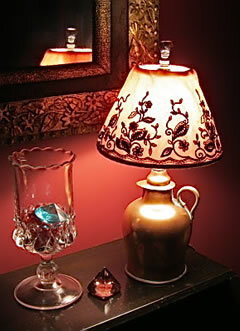 I will keep your work and lovely lamps in mind for future projects. We just got your sketch and it is perfect. These sconces are only decorative (we won’t be reading by them) so the different bulbs won’t be an issue. I will send the drawing back to you signed and dated so that you can put the sconces in the pipeline. Thanks again — you are a hero! I promised to send you photos of your beautiful shades in situ, but just haven’t gotten around to it till now. Aren’t they exquisite?… Thanks so much for your inspiring work! It’s made reinhabiting my home after my year-long plumbing/insurance disaster exile much more of a pleasure. Everyone oohs and aahs when I turn the lights on! “…The creators of most trench art objects will forever remain anonymous, but they leave a poignant legacy to the spirit of these talented artists who took scraps from the detritus of war and transformed them into a variety of beautiful objects. I just wanted to let you know that T-54 has landed!!! It came through without any problem and is just gorgeous. Thank you so much! 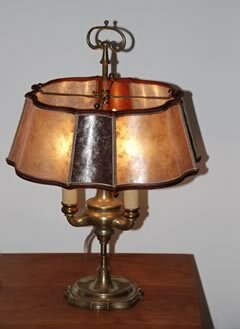 Getting your newsletter today reminded me that I have been meaning to send you a thank you for your generosity in re-doing the shades for my lamps. It took a long time to get the lamps right …in part because I was out of town a lot, but now that I have the lamps, I adore them. 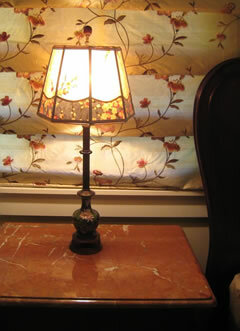 The redone shades are perfect for the lamps, and for the room. I very much appreciate your willingness to work with me until I was happy. Let us know how we can help you get the lamp you’re dreaming of. We’re happy to answer any questions about our lamps or lighting design, just get in touch.